A Bridge crystal is a smaller crystal (or crystals) penetrating and located partially in and partially out of a larger crystal. 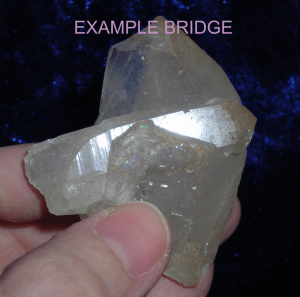 Bridge Crystals help to bridge between worlds. It may be the inner and outer worlds between your inner and outer Selves or between yourself and others in the physical environment in which you now live. Bridge crystals are helpful in any area you might imagine needing an actual bridge. They can help you heal and get in touch with your inner child (bridging the gap between your outer self and your inner self). Bridge crystals are also good for connection and perspective. 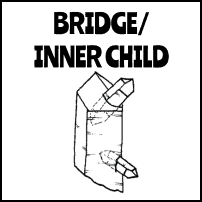 INNER CHILD is just a smaller Bridge, and typically helps you gain access to your Inner Child. Partially Elestiated Double Terminated Arkansas quartz crystal point dense with Fairy Frost, Mirror Fractures and some small Rainbows, has Bridges and some Barnacles. Fused Double Terminated Arkansas quartz crystal points with Barnacles, Bridges and a big Rainbow. Self Healed (asymmetrical) Channeler or Channeling (7-3) Arkansas quartz crystal point, has Barnacles, an Inner Child, Lineated Face, Fairy Frost and Mirror Fractures. Double Terminated Arkansas quartz crystal point, Elestiated (layered and stepped), two Bridges and Barnacles. Heavily Self Healed Arkansas quartz crystal point with a clump of Bridges, Barnacles and a small Trigonic Record Keeper. Heavily Elestiated (Etched and/or layered) Arkansas quartz crystal point with a thick layer of Adularia, a large Bridge, full of Fairy Frost. Ethereal energy, light and angelic, yet earthy and grounded. Large Arkansas quartz crystal point with a large Bridge crystal, some smaller Inner Child points, dense with Fairy Frost, Mirror Fractures and Rainbows (Devic Temple by definition) has a Self Healed base. Empathic Arkansas quartz crystal point with about 3 Bridges, Self Healing, an Imprint, Lineated Faces, Fairy Frost and a few small Rainbows. This is a blingy Arkansas quartz crystal cluster with lots of Bridging, a Channeler, an all quartz base and some Rainbows. Empathic, layered Arkansas quartz crystal Tabby or Tabular point, heavily Lineated Sides, Fairy Frost, Rainbows and Inner Child Points. Double Terminated, super water clear (Masculine) Arkansas quartz crystal point with Mirror Fractures and a Bridge sticking out from the bottom termination. Lineated Sides and Lineated Faces. Elestiated Arkansas quartz crystal point dense with Fairy Frost with a few Rainbows and a large Double Terminated (also Elestiated) Bridge coming out of the terminating end. Arkansas quartz crystal cluster with a sandstone and quartz matrix with drusy on the sandstone, and the points are Bridging (bridges) in many areas. It has both Masculine (clear) and Feminine (Cloudy) points. An Empathic crystal, comprised of three Arkansas quartz crystal points Bridged into one another, with Fairy Frost and Rainbows. Feminine Arkansas quartz crystal point with lots of excellent buzz-saw looking Growth Interference, Bridges, Self Healing and dark Inclusions. This is a feminine Arkansas quartz crystal point with lots of Bridges.